About: Ontario Shores Centre for Mental Health Sciences is a 346-bed public teaching hospital in Whitby, Ontario, that provides a wide range of assessment and treatment services to those living with complex and serious mental illness. As the first HIMSS Davies Enterprise Award and HIMSS EMRAM Stage 7 recipient in Canada, Ontario Shores is recognized as one of the world’s leading advocates for the “recovery model” of mental health care, which is focused on restoring fuller function and quality of life to patients. Challenge: Prior to their EHR implementation, Ontario Shores patients had limited access to their own care data. Their health information requests were processed manually by the organization’s health information management (HIM) department, which could take weeks. Communication with caregivers between appointments was limited, and medical record information was not easily shareable with providers outside of Ontario Shores’ network. Executives at Ontario Shores identified an opportunity to extend medical information access to patients, in support of maintaining care continuity and strengthening patient engagement. Evolving existing practices and culture from a provider-centric model to a patient-provider partnership. 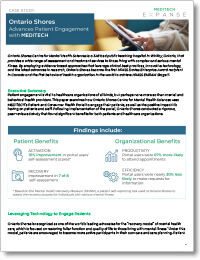 Clinicians, patients, and other healthcare professionals at Ontario Shores were involved with the design, planning, and implementation of the portal from the start. 16% improvement in patient self-assessment scores.